In many areas around the world, patronyms predate the use of family names. A patronym, orpatronymic suffix, is a component of a personal name based on the given name of one's father, grandfather or an even earlier male ancestor. 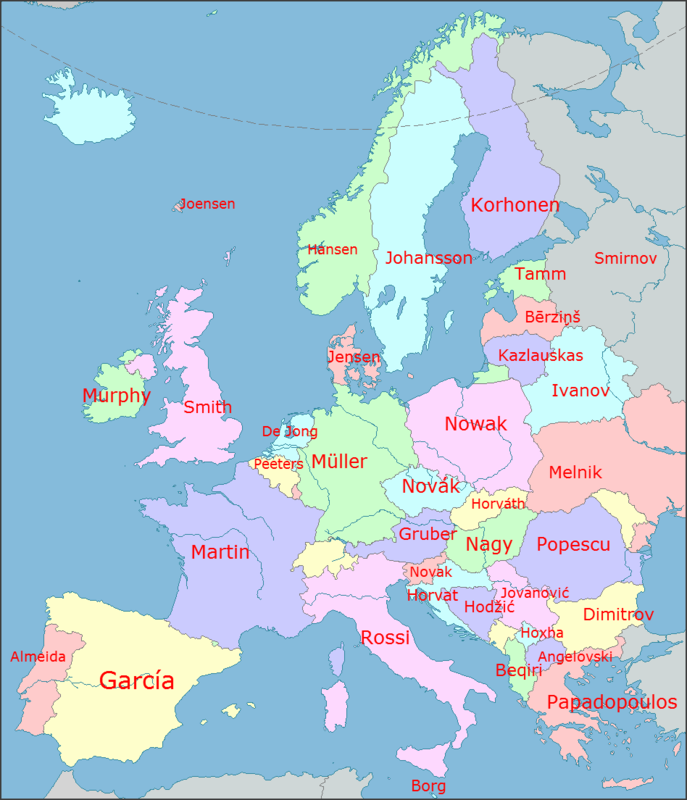 In Europe many surnames originate from patronyms. An example is the nr. 7 surname in England: Johnson (0.37%) that originally meant "son of John". On the Faroe Islands Johannesen ranks nr. 7, too (1.09%). In Norway Johansen ranks nr. 2, but the nr. 1, Hansen, is just a shortened version of the same name. In Sweden Johansson is the nr. 1 name (0.16%). In The Netherlands Jansen ranks nr. 2 with 0.46%, but when the closely related Dutch surnames Jansen, Janssen and Janse are combined, they rank nr. 1. The top 2 names in Belgium are patronyms, too: Peeters and Janssens, names mostly used in Flanders. In Russia the surname Ivanov (Ivan's/John's) ranks 2nd (1.30%). That surname is also popular is Estonia and Bulgaria. Jovanović (son of Jovan/John), ranks 1st in Serbia. The prefix Ó in Ireland means "descendant of", while the prefix Mac/Mc means "son of". Nowadays, Icelandic law still favors the use of patronyms - or more recently, matronyms - over family names. In addition, many surnames are derived from the occupation or profession of an ancestor. Every farming village used to have a blacksmith to forge iron tools, so in England and Scotland >Smith is the nr. 1 surname (1.26% vs. 1.28%). In Germany Schmidt (0.69%) is 2nd only to Müller (miller). In Luxembourg it's just the other way around. In Austria the names Schmid and Schmidt rank 16th and 24th (together 0.38%) with Gruber (miner) as the nr. 1 surname (0.40%). Smit ranks 9th (0.27%) in The Netherlands, while Smits ranks 23th. If closely related names, like Smit, Smits and Smid, are combined together, they rank 3rd in The Netherlands. The nr. 1 surname in The Netherlands with 0.53% is my mother's surname De Jong ("The Young"). My father's surname, Bos (Bush), is 14th with 0.22%. Rossi, the most popular surname in Italy, means "red-haired", Bruno, nr. 11, means "brown-haired", and nr. 20, Moretti, means "black-haired". The name Kennedy, ranking 16th in Ireland, means "ugly head". Source: http://m.imgur.com/Gtc4EKo. See also: The most common surnames in Europe.